In today’s NY Post, Sean Daly did a story about the return of Andrew ” Dice” Clay, and his exciting comeback from being on HBO’s Entourage, where he’s playing an exaggerated version of himself. I think I can honestly say that Entourage is the ONLY show I watch consistently on TV, and everyone in the cast is incredible. “Dice” is the first to admit that he’s been having career problems. 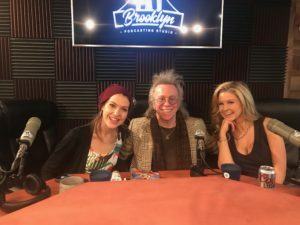 He was one of the few comedians who were ever able to fill stadiums in his heyday, which was in the late 80’s, and until the Entourage thing kicked in, he was playing small comedy clubs to make a living. 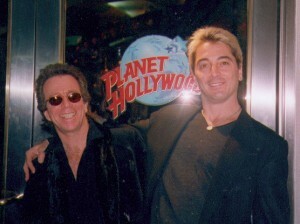 Jeffrey Gurian and Scott Baio outside of Planet Hollywood in LA at the wrap party for Very Mean Men, after finishing their own script called "Face to Face"! One night I was at The Comedy Store and wound up meeting “Dice” after one of his sets, and we stayed up talking in front of the club till about 4 A.M. I remember freezing but I didn’t want to leave because I was fascinated by “Dice”, and the stories he was telling me. He was already planning a comeback, and because of my background having written for so many Friars Roasts, he let me try my hand at writing material for him. I gave him the material, and he liked it so much, he wound up doing it on the stage of The Comedy Store right off the paper. One bit that stands out in my mind, had something to do with his ejaculate being so nutritious that the government was building a pipeline from his “member” directly to African countries suffering from hunger, and they would spray it in a cropduster to alleviate hunger. Anyway, Dice and I started hanging out along with a guy who was his cousin and another stand-up comedian. We would often go to Mel’s Diner on Sunset Blvd. for a snack. 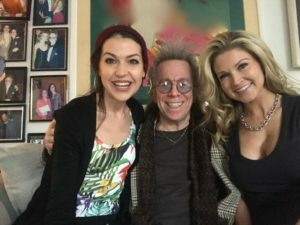 As a matter o f fact one day while we were there he had a terrible headache, and I opened up to him about my other career as a Healer whose specialty was taking away headaches. 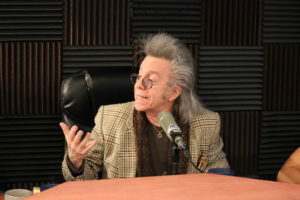 Jeffrey Gurian doing Healing work on Andrew "Dice" Clay in the parking lot of Mel's Diner to take away his headache! Most of the time at Mel’s, Dice and I would take an outside table on the street. Anytime you’re sitting with someone well known, or a gorgeous model, people want to know who you are. It’s a given. So Dice and I were sitting and eating and a guy came by, introduced himself as a producer, and asked me what I did. When I told him I was a comedy writer out of NY, he asked me for my card and asked if I could send him some of my scripts. It just so happened I had some in the trunk of my car, as I was carrying them around with me, because in LA you NEVER know who you’re going to run into and it’s always good to be prepared. A few months after I got back to New York, out of a clear blue sky, ( like those expressions??? ) 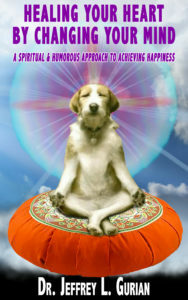 , I got a call one day from this producer, telling me he liked my script and that he thought he had a project for me. 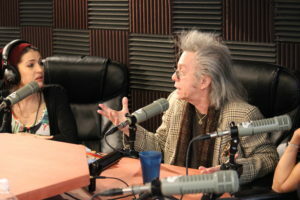 The next thing I knew he had me on a phone call to Scott Baio, who pitched me an idea he was working on, about three Italian cousins who wanted to know their Dad’s better. So they kidnapped them for a weekend of forced male bonding. I liked it, and felt it was something I could do. 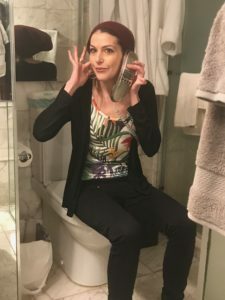 While I was on the phone, the producer put me on hold, booked me on a flight to LA, and made arrangements for me to come out to write the script. They picked me up at the airport, installed me in a hotel, and gave me keys to an office on Sunset where they brought in desks, and computers, and set me up so I could work at my own speed, and my own hours. I could come and go as I pleased. I remember the first day I met Scott. It was also at Mel’s Diner, and we had a nice meal and discussed the story line, and got along famously. He’s a super guy. We wrote the script in about 10 days, and it was called ” Face to Face” one of the only Italian themed movies, with no mob scene! It starred Dean Stockwell, Joe Viterelli, Alex Rocco, Thomas Calabro, Madchen Amick, Ellen Travolta, Meatloaf, and of course Scott Baio. We were chosen as the opening night film at the Taos, New Mexico Talking Film Festival, ( as opposed to the Taos Silent Film Festival, I guess! ), and we won two festivals for Best Comedy Feature. One of them was in Sedona, and that was really cool also. It’s an amazing feeling to have a feature film in a festival and see people lining up to watch your film, especially when you do it with a star and there’s a Q&A afterwards. It was very exciting. Scott had just finished a film with Matthew Modine, and the great Charles Durning, called “Very Mean Men” and I flew out to LA to attend the wrap party for that film at Planet Hollywood. 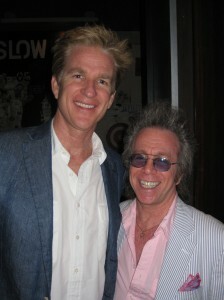 Jeffrey Gurian with Matthew Modine at an event in NYC! 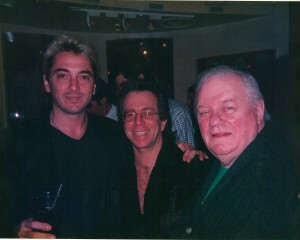 Scott Baio, Jeffrey Gurian and Charles Durning at the wrap party for Very Mean Men in LA at Planet Hollywood! Anyway, I’m so happy for “Dice” that he’s getting back into the limelight again. He still holds the distinction of being the only performer ever to be banned from MTV for life. That could be a long time. He’s a rebel and always was. I also remember being so impressed with how important his wife and kids were to him. He was a very dedicated father. Sean Daly says he’s shopping an autobiography, and will kick off a nationwide tour on Oct. 1, 2011, at MCU Park, which I believe is in the Coney Island section of Brooklyn! Good for you Dice! Work it baby!! !